In yesterday’s post, I talked about the struggle of finding a good bag that can act as my personal item on planes but can also pass as a business bag on my trips. 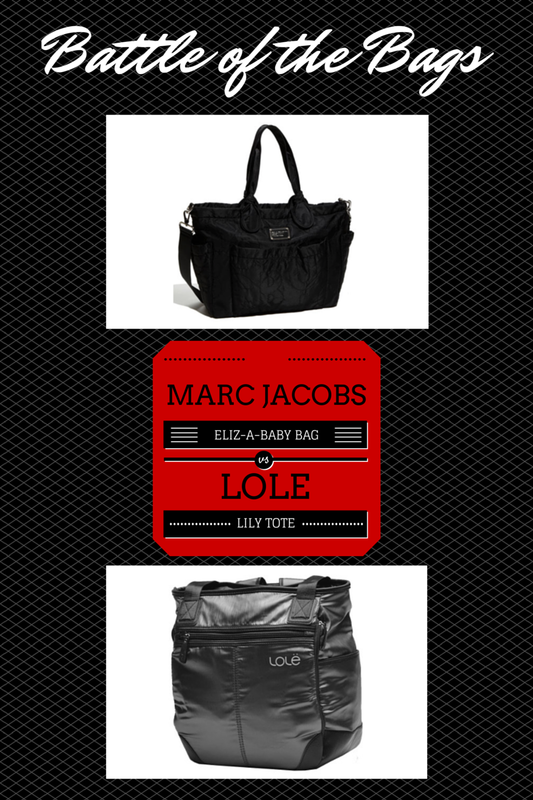 After much searching online and offline, I purchased two bags to compare side-by-side: the Lole Lily Tote Bag and the Marc Jacobs Pretty Nylon Eliz-A-Baby Bag. Neither of these bags were designed for travel; in fact, each had a different destiny before they got into my hands: the Lily is technically a higher-end gym bag, and the Eliz-A-Baby is technically a diaper bag. Nevertheless, they each had qualities I was looking for in a bag (though neither had everything I wanted). Knowing that I needed something—and soon—I pitted these two bags against each other with the intent of only keeping one. Below is a quick comparison on the specs, followed by a more in-depth analysis. Overall, there was a lot to love about the Marc Jacobs bag. I’ll admit to a slight obsession with designer bags, so it had the brand name going for it. The exterior was lovely, and it was super spacious. The lining of the bag was bright and fun, so I could actually see things fairly easily in the bag. 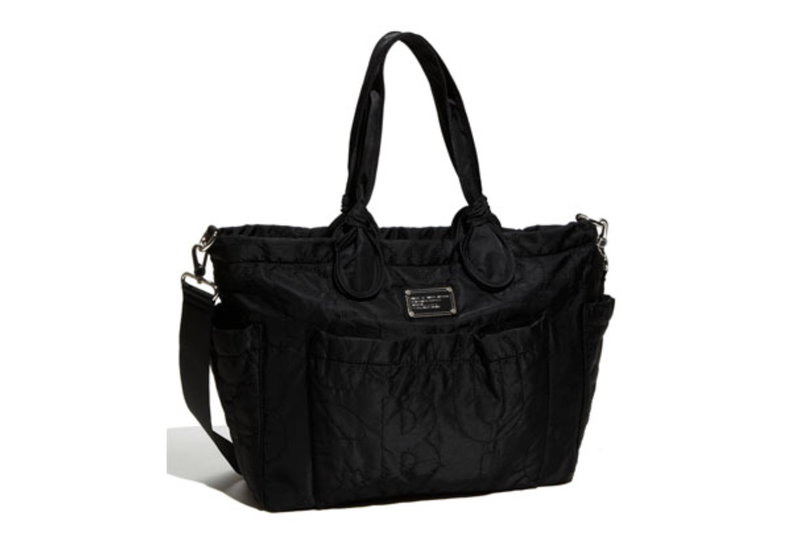 I loved that it could either be carried by the tote handles or the longer strap (over the shoulder or messenger style). And, it felt bigger than the Lole, even though the dimensions are rather close. There were also some things I didn’t love about it: While it would hold a laptop, it didn’t have a built-in sleeve for one, so that was major points against it. Another major detractor for this particular purpose was that it didn’t have a way to connect to my rolling suitcase. And finally, I wish that the pockets on the outside zipped so I would feel confident that nothing would fall out. The functionality of this bag really couldn’t be beat. The zippered compartments, built-in laptop sleeve and other nice touches such as coming with a snap-in cosmetic pouch and attached key fob were all major pluses for this tote. I wasn’t wild about it not having a messenger-style option for carrying it, but with the weight of my bag when traveling, I knew the convertible backpack feature would be a nice to have. 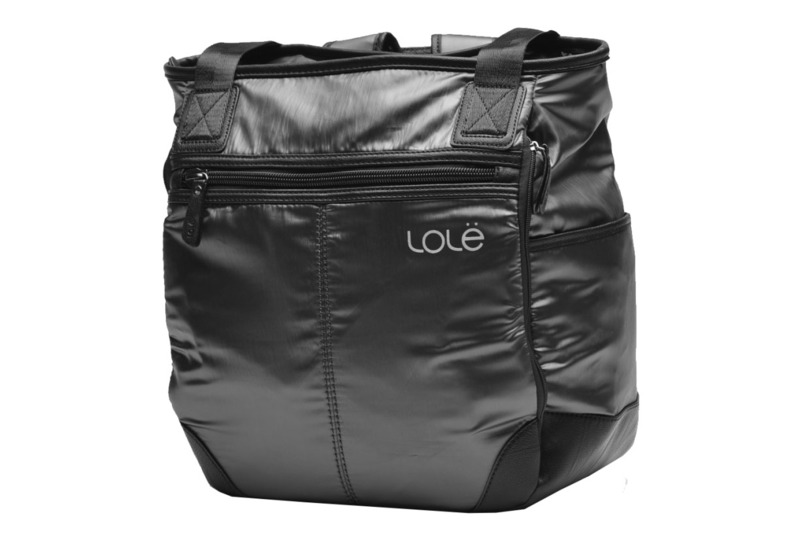 It also has a vertical zip compartment on the front (which is technically designed to hold a yoga mat) that I knew would be great for slipping over the handles of my rolling suitcase. As for the bad, I wasn’t wild about the material. While it was also nylon, the nylon felt flimsy, and I wasn’t sure it would hold up to the treachery I put my bags through when traveling. Also, it is designed more as a sport bag than anything else, so I was concerned that everyone would know I was carrying around a fancy version of a gym bag. Both bags ultimately fit everything that I needed to carry, including my laptop, a few files, notebook, iPad, noise canceling headphones, charging cords, glass, sunglasses, wallet, phones, camera and more. But the decision came down to which one would honestly function better for both traveling and business. Ultimately, I went with the Lole Lily Tote Bag. The features that won me over were the laptop compartment and the option to convert it into a backpack. I knew I could hide the backpack straps easily if needed, and it would be great to distribute the weight when it was packed full. Check back later to see my follow-up review after putting the Lilly through the paces of several flights. Did you ever do a follow up on this? Thinking about purchasing a Lole Lily and wondered if you loved yours or ditched it.